New York’s transit system has reached breaking point, and everyone suffers as a consequence. 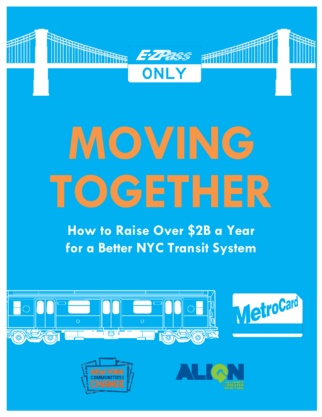 Moving Together, a report by ALIGN and New York Communities for Change, is the first report to show the economic, equitable, and environmental benefits of political cooperation between the State and the City, and what it would really look like to combine congestion pricing and a tax on New York’s wealthiest residents. The current political debate over how to fund New York’s transit pits congestion pricing against a tax on the wealthiest New Yorkers. At the same time, political news coverage often fixates on the battles between Mayor de Blasio and Governor Cuomo. Here’s the reality: de Blasio and Cuomo need to put aside their differences, stop the stalemate, and create a more reliable funding stream for New York’s transit system that involves both congestion pricing and a millionaires tax. Governor Cuomo has the power to create a sustainable funding stream for New York City’s public transportation system, which is largely controlled at the state level. The City should work with the Governor to make this a reality. Read the press release, with quotes by ALIGN, NYCC, Riders Alliance, Tri-state Transportation Campaign, Community Service Society, and Assemblymember Robert Carroll.